Kids around the world are standing up and taking charge of creating a more sustainable and healthier planet. 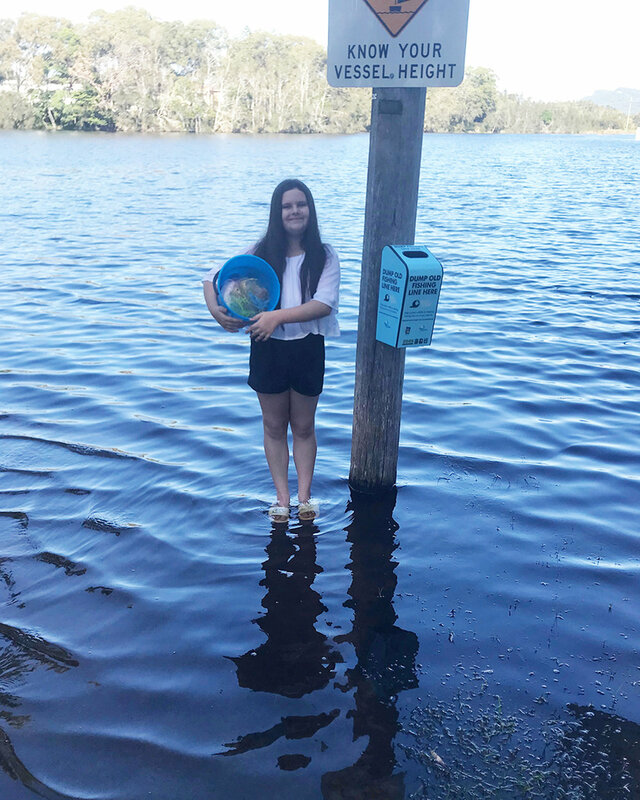 Eleven-year-old eco-warrior and fashionista Shalise Leesfield of Lake Cathie, Australia, is one such visionary youngster. Shalise has created her own climate change movement. 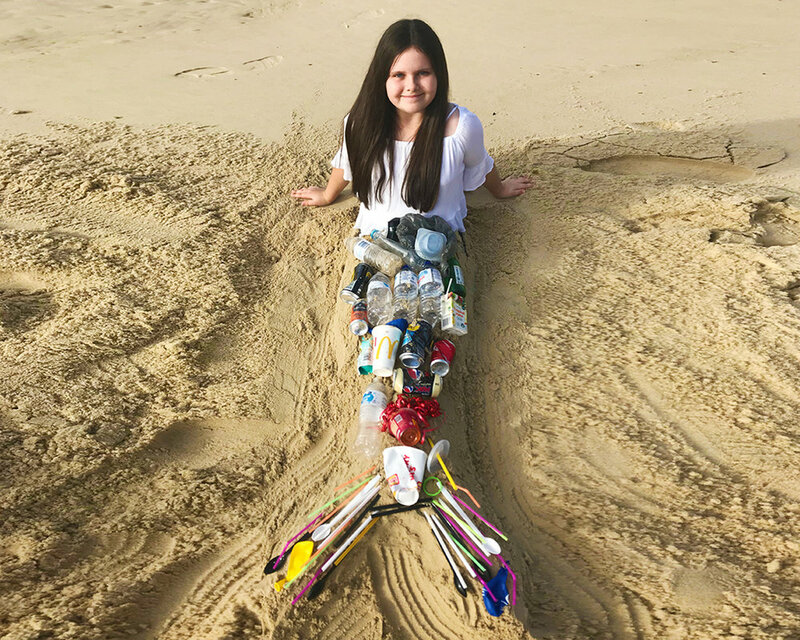 Her mission is to protect marine life by ridding Australia’s beaches of plastic debris, with a specific focus on removing fishing wire and using the wire to create unique bracelets. Although young, Shalise is passionate and driven with big plans and an even bigger heart. Inspired by Shalise, I asked her about her new venture. AGB: First off, I’m so inspired by your story! Can you tell me a little more about what you do with the fishing wire you collect and the bracelets you create? SL: I make all the [fishing wire] bracelets myself. I have buckets and buckets full of the discarded fishing lines that I have collected. I wanted to do something with the lines to ensure that they stayed out of the ocean and kept the marine life safe from harm. I have started an ‘ocean devotion’ project where I have been selling my bracelets in the hope that I can do my bit to help save our marine animals – one bracelet at a time. I love to upcycle and recycle and I thought, what better way than to make something beautiful and pretty out of something that can be so ugly for marine life! That's where I came up with the idea for bracelets. My slogan that goes with them is, “wear my fishing line bracelet on your arm, to keep it out of the ocean and the marine life safe from harm.” The fishing line I find on the shoreline and waterways comes in all different colours and thicknesses. Because of this all the bracelets I make are very unique and special and always one of a kind. The bracelets mean so much to me. When I sell them to people it makes me happy to know that the fishing line is kept safely out of the sea and worn close to people’s hearts. It is a pretty reminder that we need to do all we can to save our beautiful marine animals from ghost gear. Each bracelet has a unique marine animal or ocean themed charm to represent the life and importance of the many marine animals that are sadly affected by marine pollution. Every year thousands of marine animals are injured due to discarded fishing lines. It is one of the most harmful things to be washed into the ocean because it is strong and invisible in the water. A lot of marine animals can’t see it floating in the water and can get tangled in it and be unable to break free. It is also a problem as it takes up to 600 years to break down in the ocean! Sea turtles, marine mammals, and even sea birds can be severely injured or die from entanglement in discarded fishing line or plastic. My hope is that I will keep improving and working hard to make as many bracelets as possible so I can raise as much money as I can to help our magnificent ocean friends. “until we stop marine debris at the source, we’ll just be cleaning it up forever". AGB: That is so admirable! Where can interested parties buy your bracelets? SL: I sell the bracelets for $4 each (AUS) plus postage. Since posting on my Instagram page I have received so many comments and private messages asking where people can purchase the bracelets. I am in the process of deciding where to sell them online. People all over the world have expressed interest as far as New York, Kenya, Florida, New Zealand, England, Indonesia, and Scotland, just to name a few places. I have sold them at the foreshore markets in my town. There is a cafe in Australia that has said that they would love to stock and sell my bracelets. I just received an e-mail today from a lady wanting 25 bracelets to give to children as a party bag gift for her sons 11th birthday! AGB: That’s great! How real is the problem of fishing wire on Australian beaches? SL: Fishing is a popular activity in Australia. It’s estimated that over five million Australians take part in recreational fishing as a leisure activity. With so many people casting out their lines you can imagine the huge amounts of fishing line found in our waterways. Bait bags, fishing line, hooks, and sinkers make up a large percentage of debris found on beaches all over the country. When I do my clean ups I find clumps of line just lying on the shorelines and in and around the rock areas. AGB: What an incredible undertaking. I know that you’ve had bins made specifically for recycling the fishing lines. Could you tell me a little more about that? How difficult was it for you to get the bins made? Did it take a great deal of time? SL: I got the bins ready made from The Seal The Loop program. I collected the bins and then my Dad installed them at the fishing locations. The fishing line collection bins are specially designed bins that are made from recycled plastics collected at the Melbourne Zoo. Visitors at the zoo are encouraged to discard used plastics (generated through lunches onsite) within plastic recycling bins. The plastic that is collected is then recycled and turned into bins. AGB: That’s so clever. How did the bin idea come about? SL: I spend most of my spare time at the beach. I was always coming across large clumps of unwanted fishing line scattered all over the sand. When I found out on the Internet about how bad forgotten fishing line can be for the marine animals, it made me really sad and it became my mission to clean up my local beaches in a bid to help save aquatic animals and birdlife from entanglement. I did some research and came across the Seal The Loop organization. I wrote them a letter asking if I could install some bins in our town. AGB: Who is in charge of collecting the fishing line? Does that wire go to regular recycling plants? SL: I empty the bins weekly and record the amount I have collected, which is on average about 3 to 4 handfuls. This information is then forwarded to the Council on an ongoing basis. I then turn the fishing line into jewelry so I can sell it and use the money to help with ocean conservation. Thanks so much, Shalise! I know I’ll never think about fishing line the same way again. I hope we can all be inspired and moved by Shalise’s dedication and ingenuity. I for one, can’t wait to wear my own fishing line bracelet proudly. As Shalise has said, “until we stop marine debris at the source, we’ll just be cleaning it up forever. We need the ocean - and everything in it. And the ocean needs us.” To learn more and support Shalise and her work, just visit her Instagram account: instagram.com/shalisesoceansupport.